it just doesn't seem right that the first time my child plays a game that she just learned, she loses. she's a child. i want to let her win. i want her to taste it so that she'll know what she's playing for. i want her to go for it. i'm not and never have been naturally competitive. but when it comes to my child, i want her to succeed more than i've ever wanted success for myself. all of this emotion and realization bubbled over last weekend when my mom entered my children in a Halloween Costume Contest at a carnival. yall. come on. 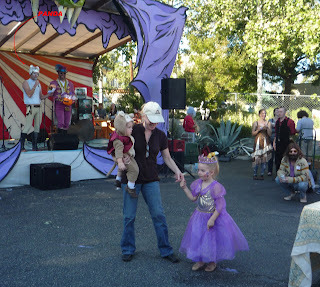 my kids, cute as they are, couldn't win a costume contest in Austin on a NORMAL day let alone Halloween. have you seen the way Austinites dress? you should have seen them on Halloween. bizarre. outrageous. bold. colorful. beyond imagination. organic. adults and children alike were costumed to the nines. it was like a Cirque de Soile- Woodstock- Mardi Gras mashup. my kids were characters from a Disney movie. as cute as that is, it is not award-winning in an Autin Halloween Costume Contest. sorry, babies. Granny was so excited about the contest, paid the entry fee, and entered my poor sweet innocent Jasmine and Abu. i knew they wouldn't win so i protected my child. i didn't tell her that she was in a contest. i didn't want her to know that she would be participating in something and she didn't even stand a chance. through talking and waiting, and when we made them go up to the stage, BigGirl realized what was going on. she wasn't born yesterday. she was excited to prance around in front of the crowd. i was her biggest fan, oooh'ing and aaah'ing and clapping for her until my hands hurt. i eyed the judges, Austinites themselves. they smiled at the princess and the monkey, took notes, and puffed their clove cigarettes. i distracted myself when the Costume Contest winner was being announced over the loud speaker. i went to the coffee shop to buy my babies the biggest, gooiest, peanut butter and jelly sandwiches i could find. comfort food. BigGirl was bummed that she didn't win. i could see it in her face. she slumped over and wanted to leave. the prize wasn't even all that great, i told her. you did great and there were some really cute costumes, i said. but it just didn't seem right. before we left the carnival i tracked down the Costume Contest emcee, Panda. he wasn't hard to find with his tinfoil panda head and sequin-covered blouse. now, i know losing is part of life. i know that i need to teach her how to lose just as i need to teach her how to win. both lessons are important. but today she lost at a game she wasn't even prepared to play. and she looked so stinkin pretty doing so. "Panda, don't you think Princess Jasmine is beautiful?" i asked him. fishing, maybe, but he knew what i wanted. "Yes, of course! Where is she?" and he pranced through the crowd to find her, knealt down in front of my child's sweet face and told her that he thought she was a beautiful princess. distraction or confirmation, compliment or embarrassment, whatever it was that he gave her, she wasn't sad about losing the contest anymore. she held her head high and smiled from ear to ear. she learned that even though she did her best, she will sometimes lose. and i learned to let her.